A lot of nostalgia gets waxed here on RF Cafe, to which frequent visitors can readily attest. Old timers (if you're not one now, you some day will be) often like to see remembrances of days of yore, the halcyon days of past hobbies, family, long naps, school (yuk), vacations, and other pleasurable times. Hopefully, you already have or will soon have a few of your own. 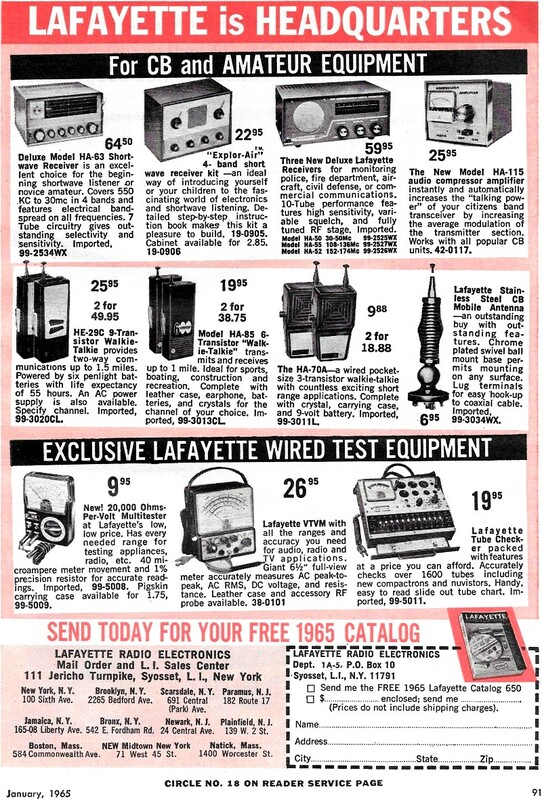 This 3-page Lafayette Radio Electronics spread from a 1965 issue of Popular Electronics magazine is typical of what what avid electronics hobbyists would have read and drooled over with so many great items in the offering. If you were like me, the cost of most of the things I wanted were well outside my budgetary reach (it's still like that, unfortunately). 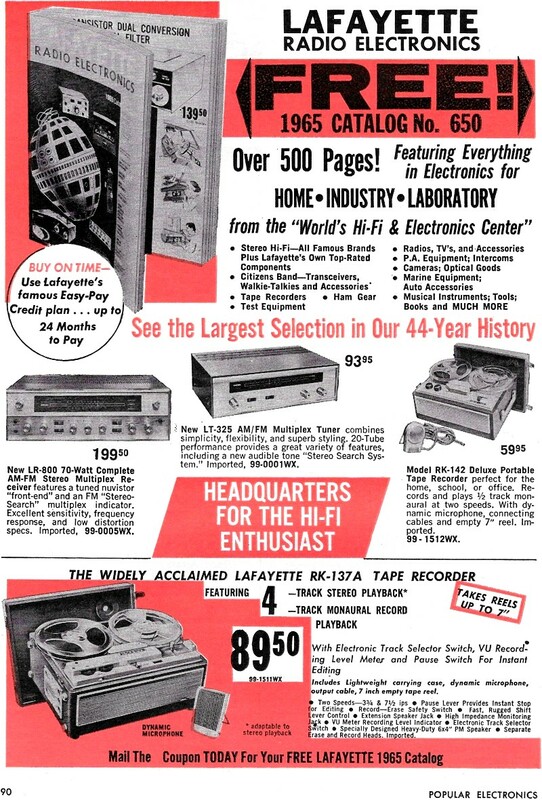 Prices for electronics gizmos were quite high as compared to today for equivalent (and often much greater) functionality and quality. 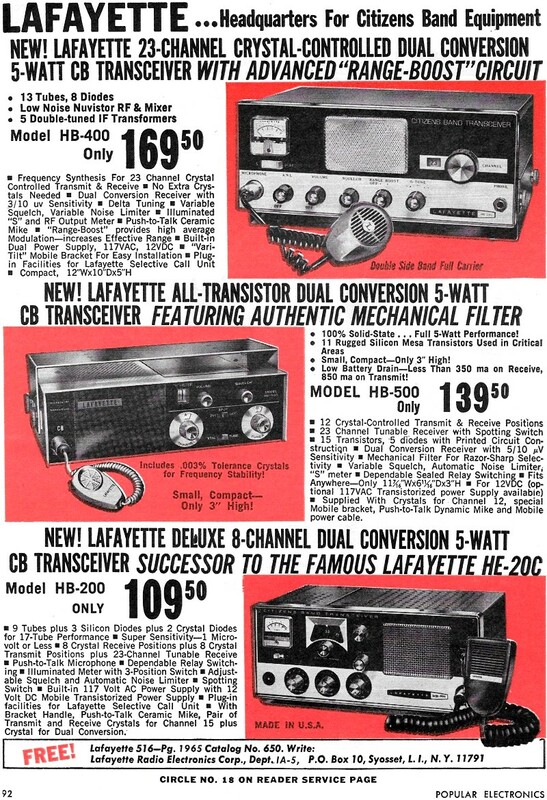 According to the Bureau of Labor Statistics' Inflation Calculator, that Lafayette 23-channel, crystal-controlled, dual conversion, 5-watt CB transceiver on page 92 which cost $169.50 in January of 1965 would drain your bank account by a whopping $1,361.14 in today's money! A nuvistor was used in the front end of the HP3400A True RMS Voltmeter (thanks to Michael M. for that). 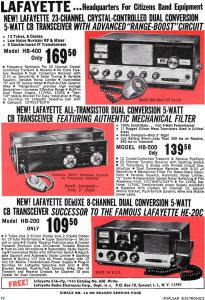 Also, thanks to Bob Davis for pointing out that the Lafayette HB-400 CB radio sported a Nuvistor in the receiver front end. Here is a Nuvistor info resource. See the "Nuvistors and Micro-Modules" and the "The NASA 136" articles, too. from the "World's Hi-Fi & Electronics Center"
New LR-800 70-Watt Complete AM-FM Stereo Multiplex Receiver features a tuned nuvistor "front-end" and an FM "Stereo-Search" multiplex indicator. Excellent sensitivity, frequency response, and low distortion specs. Imported, 99-0005WX. New LT-325 AM/FM Multiplex Tuner combines simplicity, flexibility. and superb styling. 20-Tube performance provides a great variety of features, including a new audible tone "Stereo Search System." Imported, 99-0001WX. Model RK-142 Deluxe Portable Tape Recorder perfect for the home, school, or office. Records and plays 1/2 track monaural at two speeds. With dynamic microphone, connecting cables and empty 7" reel. Imported. 99-1512WX. Takes Reels up to 7"
Includes lightweight carrying case, dynamic microphone, output cable, 7 inch empty tape reel. • Two Speeds-3 3/4 & 7 1/2 ips. • Pause lever Provides Instant Stop or Editing • Record-Erase Safety Switch • Fast, Rugged Shift ever Control. • Extension Speaker Jack. • High Impedance Monitoring Jack • VU Meter Recording Level Indicator. • Electronic Track Selector Switch. • Specially Designed Heavy-Duty 6x4" PM Speaker • Separate Erase and Record Heads. Imported. The New Model HA-115 audio compressor amplifier instantly and automatically increases the "talking power" of your citizens band transceiver by increasing the average modulation of the transmitter section. Works with all popular CB units. 42-0117. HE-29C 9-Tran­sistor Walkie-Talkie provides two-way communications up to 1.5 miles. Powered by six penlight batteries with life expectancy of 55 hours. An AC power supply is also available. Specify channel. Imported, 89-3020CL. 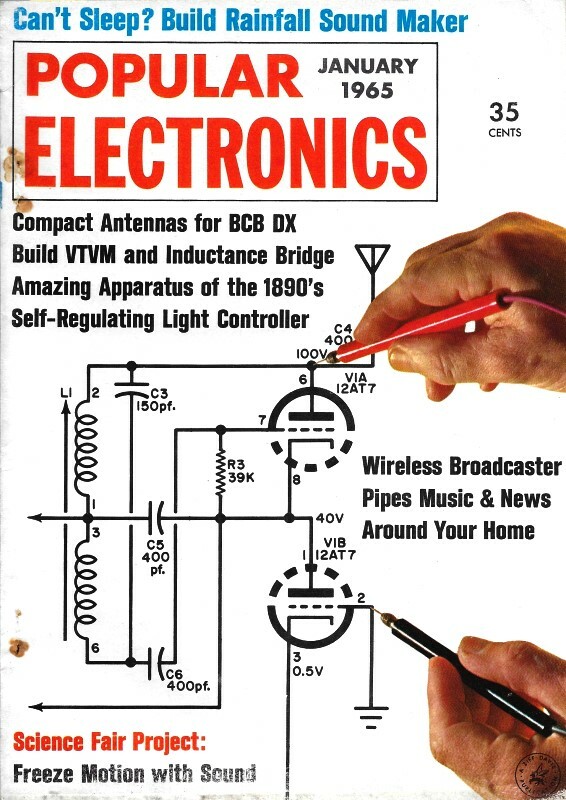 Model HA-85 6-Transistor "Walkie-Talkie" transmits and receives up to 1 mile. Ideal for sports boating, construction and recreation. Complete with leather case, earphone, batteries, and crystals for the channel of your choice. Imported, 99-3013CL. The HA-70A - a wired pocket­size 3-transistor walkie-talkie with countless exciting short range applications. Complete with crystal, carrying case, and 9-volt battery. Imported 99-3011L. Lafayette Stainless Steel CB Mobile Antenna - an outstanding buy with outstanding features. Chrome plated swivel ball mount base permits mounting on any surface. Lug terminals for easy hook-up to coaxial cable. Imported, 99-3034WX. New! 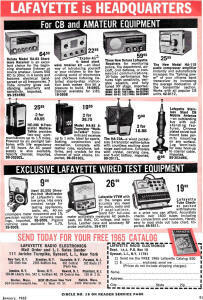 20,000 Ohms-Per-Volt Multitester at Lafayette's low, low price. Has every needed range for testing appliances, radio, etc. 40 microampere meter movement and 1% precision resistor for accurate readings. Imported, 99-5008. Pigskin carrying case available for 1.75, 99-5009. Lafayette Tube Checker packed with features at a price you can afford. Accurately checks over 1600 tubes including new compactrons and nuvistors. Handy, easy to read slide out tube chart. Imported, 99-5011. (Prices do not include shipping charges). • 100% Solid-State ... Full 5-Watt Performance! • Small, Compact-Only 3" High! • Low Battery Drain - Less Than 350 ma on Receive, 850 ma on Transmit! • 15 Transistors, 5 diodes with Printed Circuit Construction • Dual Conversion Receiver with 5/10 μV Sensitivity • Mechanical Filter For Razor-Sharp Selectivity • Variable Squelch, Automatic Noise Limiter, "S" meter • Dependable Sealed Relay Switching • Fits Anywhere-Only 11 7/16"Wx6 11/16"Dx3"H • For 12VDC (optional 117VAC Transistorized power Supply available) • Supplied With Crystals for Channel 12, special Mobile bracket, Push-to-Talk Dynamic Mike and Mobile power cable. • 9 Tubes plus 3 Silicon Diodes plus 2 Crystal Diodes for 17-Tube Performance • Super Sensitivity - 1 Microvolt or Less • 8 Crystal Receive Positions plus 8 Crystal Transmit Positions plus 23-Channel Tunable Receive • Push-to-Talk Microphone • Dependable Relay Switching • Illuminated Meter with 3-Position Switch • Adjustable Squelch and Automatic Noise Limiter • Spotting Switch. • Built-in 117 Volt AC Power Supply with 12 Volt DC. Mobile Transistorized Power Supply • Plug-in facilities for Lafayette Selective Call Unit • With Bracket Handle, Push-to-Talk Ceramic Mike, Pair of Transmit and Receive Crystals for Channel 15 plus Crystal for Dual Conversion.